Every time there is a mass shooting or some horrific event in the United States involving guns, some (usually Democratic or leftist) politician or leftist talking head on television will boldly proclaim that America has become a “culture of death”. I agree, but not for the same brash pontificating reasons they promulgate. America, indeed, has become a culture of death, but it started long before the first mass shooting at a school. Conspicuously absent from the culture of death dialogue on the left is the fact that God, the Bible and prayer have been stripped from our nation’s schools and the killing of the innocent has become the law of the land. Abortion is a form of child sacrifice that God calls evil (see Leviticus 18:21, 20:1-5 and 1 Kings 11:5-8). The debate from the left on what constitutes a human life in the mother’s womb is a non-issue as far as I am concerned and as far as God is concerned. In the Bible, God declares that, “Before I formed you in the womb I knew you; before you were born I sanctified you . . .” (Isaiah 49:1, 5). The left can argue all it wants about when a life is a life, but it is God who has stated that a life begins when He has conceived of it. On top of these sweeping events affecting our nation’s children who become aggressive adults is the onslaught of violent video games and gratuitous Hollywood murder and mayhem filth that permeates our collective senses, but especially that of our youth. Video games are no longer gratifying unless a 9 year old can blast away the humanoid of his choice or annihilate by a multitude of gruesome methods any foe he desires. And we have the audacity to wonder why a growing number of our children are killing children or anyone else who invades their space. One Virginia House of Delegates representative got it right in a speech before his peers on March 2, 2018. You can watch and listen to it here. Republican Nick Freitas (Culpepper, R-30) stated unequivocally that gun control is not the issue, the issue is the breakdown of our society. PLEASE NOTE, the “culture of death” is not an issue of gun control or Second Amendment rights, but a mindset change on what is truly important to us as a people. Do we want God in our lives or not? Is murder, murder, whether of the unborn or those walking upright? What respect for life do we truly honor and not give lip service to on a daily basis? The great pastor and preacher, Dr. Peter Marshall, at the height of World War II gave a riveting sermon on March 11, 1944 called Trial by Fire. ** It was based on 1 Kings 18:21. Some excerpts from that famous speech which I had the privilege of transcribing from a cassette tape his son gave me. Materialism had a god, Dr. Marshall thundered. His name was Baal. He offered to his devotees things that human instincts craved. He was a god of the flesh. His priests encouraged the people to follow their natural inclinations. It was worship and indulgence expressed in lust and adorned in selfishness. It had no inhibitions at all. . . . So, morality became a relative thing. The old absolutes were regarded as far too intolerant. The national moral standards were lowered. . . . It was a time now for men to take sides. There was no middle ground. They could not be neutral. They had to be on one side or the other. They had to decide whether their nation would be governed by God or ruled by tyrants. . . .
President George Washington also had it right. Of all the dispositions and habits which lead to political prosperity, religion and morality are indispensable supports. In vain would that man claim the tribute of patriotism, who should labor to subvert these great pillars of human happiness, these firmest props of the duties of men and citizens. The mere politician, equally with the pious man, ought to respect and cherish them (Farewell Speech, September 17, 1796). *To learn more about these pivotal cases and the status of America, get my book, Revelation 18 and the Fate of America. **Dr. Marshall’s complete sermon is in my book above. Just released a second addition (revised and expanded) of a an early American history book I published in 2005. 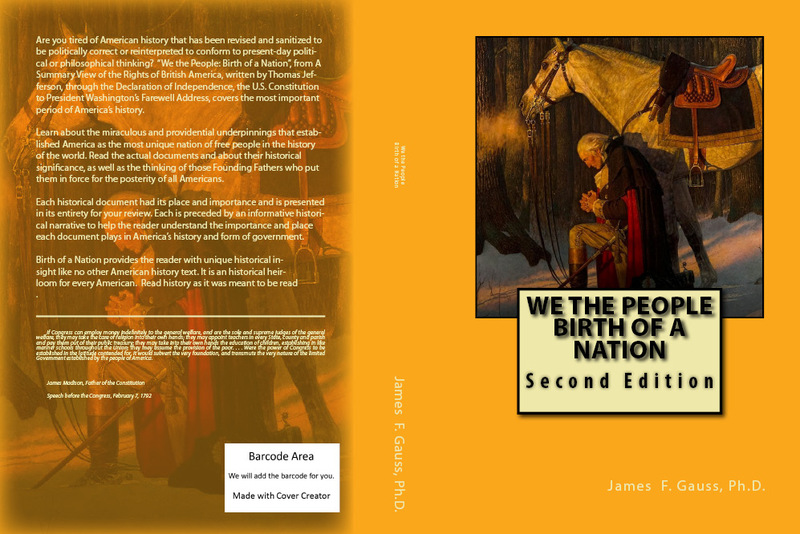 If you are an American history buff or just want to know the true history behind America’s start and the Founding Fathers, you will want a copy of We the People, Birth of a Nation, Second Edition for your very own library. I guarantee you will not find another American history book like it anywhere. It is now available on Amazon, but will soon be available at other online sites or through your local bookstore. At 640 pages it is chock full of original documents and the words of the Founders. It’s an easy read that you will enjoy and cherish as a family heirloom. Are you tired of American history that has been revised and sanitized to be politically correct or reinterpreted to conform to present-day political or philosophical thinking? We the People: Birth of a Nation, from A Summary View of the Rights of British America, written by Thomas Jefferson, through the Declaration of Independence, the U.S. Constitution to President Washington’s Farewell Address, covers the most important period of America’s history. Learn about the miraculous and providential underpinnings that established America as the most unique nation of free people in the history of the world. Read the actual documents and about their historical significance, as well as the thinking of those Founding Fathers who put them in force for the posterity of all Americans. Each historical document had its place and importance and is presented in its entirety for your review. Each is preceded by an informative historical narrative to help the reader understand the importance and place each document plays in America’s history and form of government. Birth of a Nation provides the reader with unique historical insight like no other American history text. It is an historical heirloom for every American. Read history as it was meant to be read.